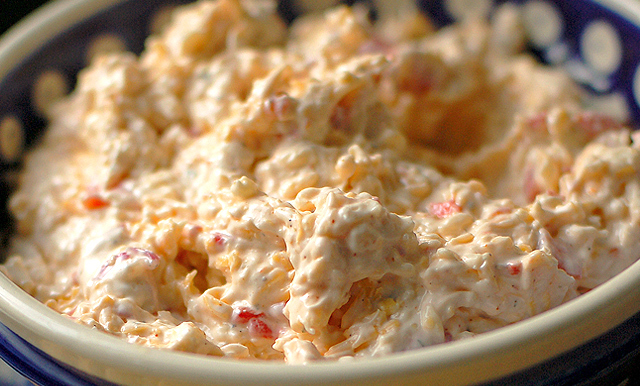 If there is anything more truly southern than pimento cheese, I'm not sure what it is. This stuff is the real deep South deal. Right up there with fried chicken, sweet tea and biscuits. The beauty is that you have so many variations of the basic recipe, that you can add most anything, so be inventive. I've given you a basic recipe as a starting point. Serve it on crackers, make a stunning cheese and tomato sandwich, use it for grilled cheese. It's amazing stuff. And yes, it can be veganized by substituting the cheddar with a non dairy option like Daiya and using a vegan Worcestershire Sauce and mayonnaise. Combine all ingredients by folding them together until incorporated. Adjust for flavor and cover with plastic wrap and refrigerate for 8-12 hours. Then mix well and transfer to individual ramekins or a suitable serving bowl. Allow 30 minutes to come up to room temp and serve with crackers, crudités, sliced baguettes or whatever you like.